Even if you have no need for a premium gaming phone, it's hard not to covet this upcoming Asus ROG phone. So far, it's one of the stars of Computex. Asus jumps into gaming phones with the ROG Phone, which uses cherry-picked Qualcomm Snapdragon 845 chips to achieve ultimate performance. 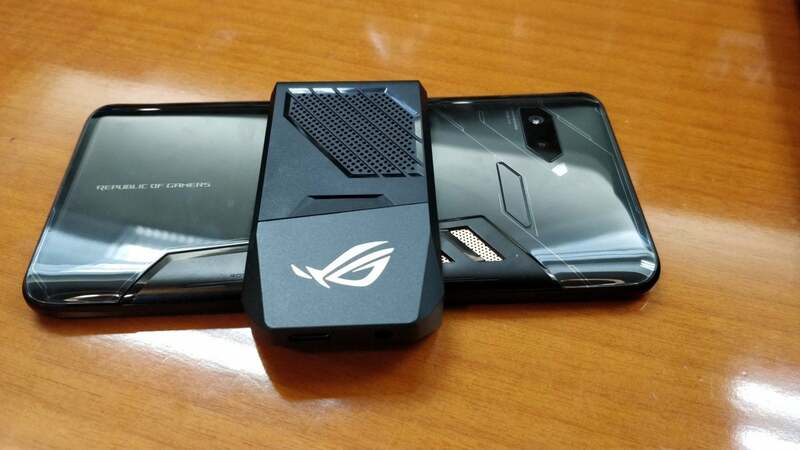 Move over, Razer: Asus ROG has announced the ROG Phone, which the company claims will be the fastest phone ever built. The ROG Phone certainly exudes a sense of power, with metallic accents and thermal vents communicating that the phone was influenced by the ROG line of gaming PCs. There’s even RGB lighting that can be triggered by calls or notifications. And if you’re a gamer, this should sound familiar: inside each ROG phone is a cherry-picked “speed binned” version of the Qualcomm Snapdragon 845. But that’s not all. 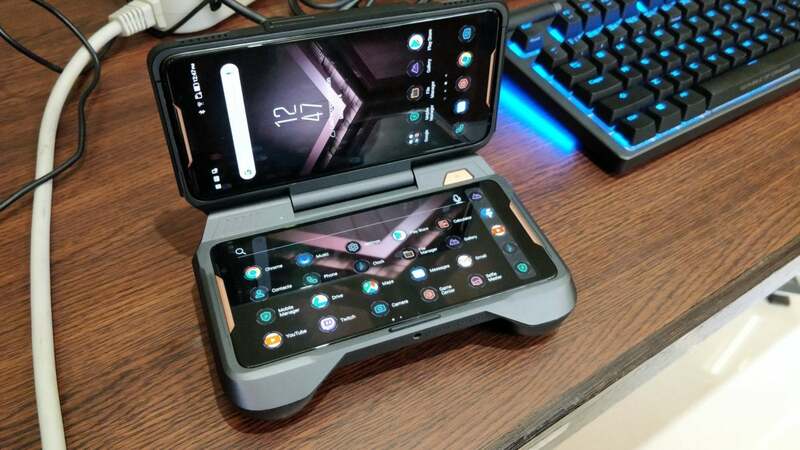 The ROG phone is complemented by four accessories that elevate it to almost console status, including a cooling solution, dual-screen dock, a PC dock, and a Nintendo Switch-like controller dock. Razer’s own gaming phone has some serious competition. The ROG Phone is a 6-inch phone, heavy but still comfortable to hold in the hand. The AeroActive cooling clip is attached. Inside the ROG Phone is a 2.96-GHz Snapdragon 845; normally, the Snapdragon 845 is clocked up to 2.8GHz. (It’s not clear whether ROG took steps to overclock or bin-split the associated Andreno 630 GPU.) 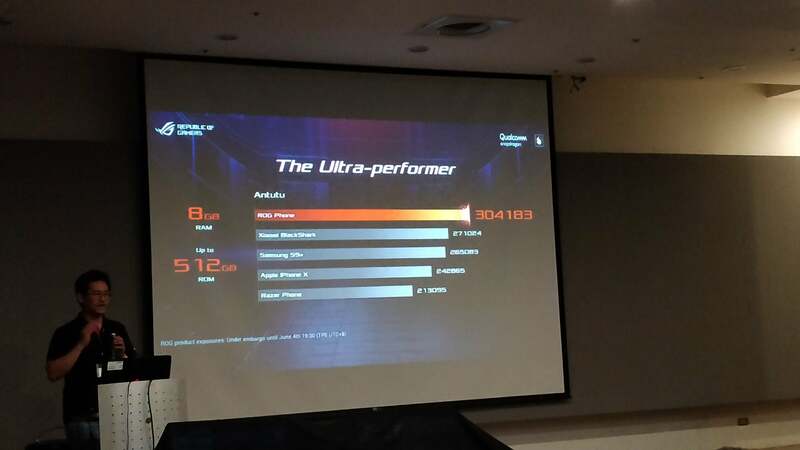 But the company backed up its performance claims by showing off benchmarks: the phone scored 304183 using the Antutu benchmark, and 5207 and 66874 using 3DMarks’ Slingshot Extreme Unlimited and Ice Storm Unlimited benchmarks, respectively. Asus believes that the ROG Phone is the fastest ever. What, that isn’t enough? The ROG Phone also includes X Mode, which kills all background processes and dedicates the available memory to games, increasing performance even more. 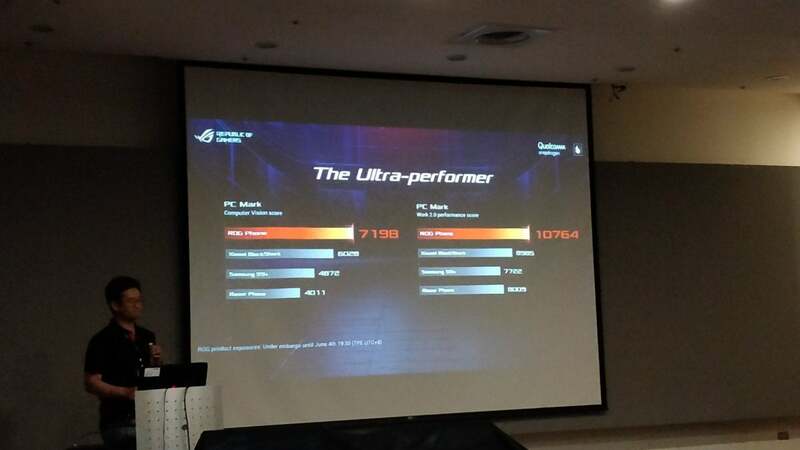 Asus was so confident that it published a number of benchmarks to support its claims. Inside the phone is 8GB of RAM, a massive 512GB of flash storage and a 4,000 mAh battery that should deliver up to 11.5 hours of gaming on Wi-Fi, according to the company. Connectivity is based on Cat 16 LTE and 60GHz 802.11ad WiFi—a cut above the Wi-Fi capabilities you normally find in most phones. On the outside, the ROG Phone boasts a DCI-3 rated AMOLED panel, with a 90Hz refresh rate and 1ms response time. Audio comes from a DTS Headphone:X-rated audio engine. There are even ultrasonic “shoulder buttons” that detect your fingers, and serve to record button presses for games that demand it. The ROG Phone’s innovative design doesn’t stop there. Because of the demands games place on a CPU and battery, gamers often need to charge their phone while playing their game. But ROG put the charging port on the side of the phone, allowing gamers to remain in landscape mode. The phone also places the charging hardware outside of the phone in the charger, reducing an additional source of heat while the phone is charging. Less heat, more performance, Asus executives said. And if that isn’t enough, then you’ll need a cooling solution, one of the accessories that will ship with the ROG Phone. The AeroActive Cooler includes RGB lighting as well as an active fan, plus a USB-C port and headphone jack. Inside the phone is what ROG calls the GameCool system, a 3D vapor-chamber cooling system that helps the phone’s clock speeds soar. But an external AeroActive Cooler clip also plugs into the charging socket and provides an active fan that routes cool air onto the back of the phone, with a bonus USB-C port and headphone jack. 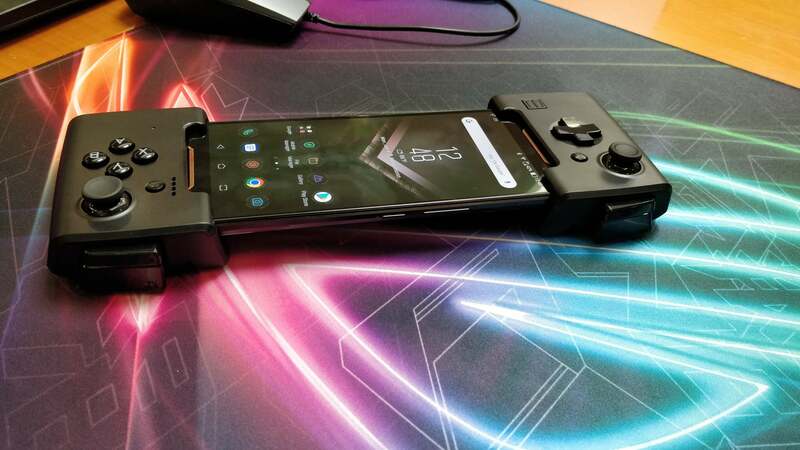 A GameVice controller, which clamps onto the ROG Phone at either end and provides a Nintendo Switch-like experience with external thumbsticks and shoulder buttons. The GameVice Controller, which works with the WiGig Dock to project the phone onto a wireless display. With the Mobile Desktop Dock, you can exend the phone’s display onto a monitor, and add mouse and keyboard support. 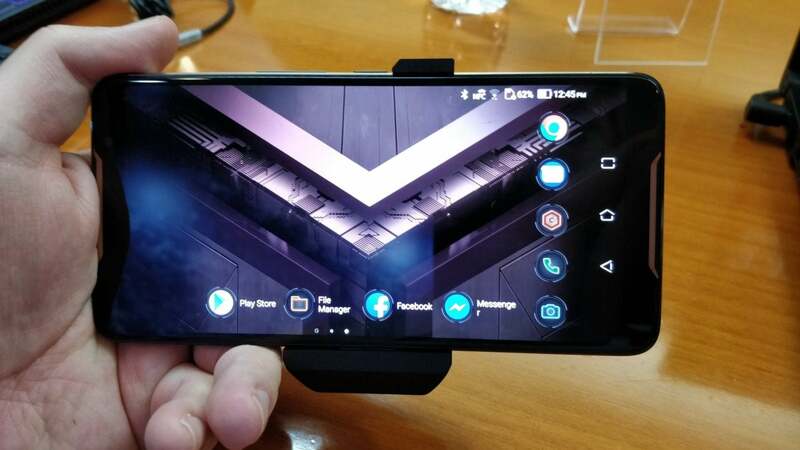 Finally, there’s the TwinView Dock, which adds a second 6-inch (2160 x 1080) screen to the ROG Phone. 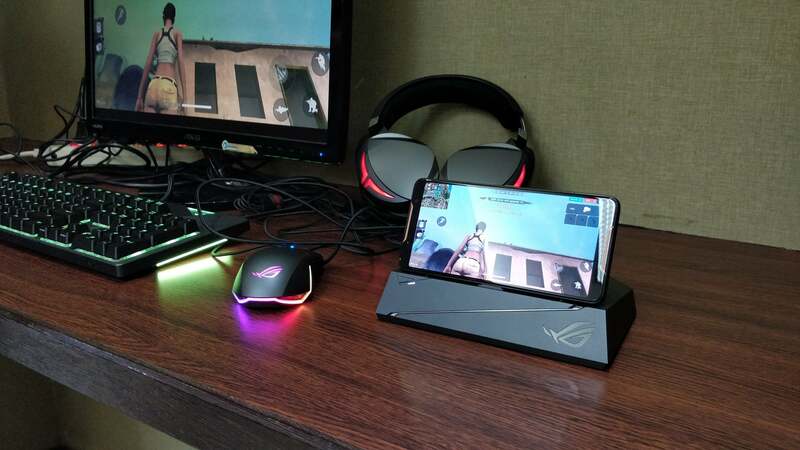 Not only is it good for viewing a second screen while gaming (a mobile Twitch stream, perhaps) ROG said that it is working with game developers to optimize their games for the split-screen technology. It also includes front-facing speakers, a force-feedback engine, enhanced cooling and even a 6000mAh battery pack. The innovative TwinView dock adds an extra screen...just because. What’s the price for all of this? We have no idea. But it’a probably fair to say that the price will climb over $1,000, without the peripherals. As for when we’ll see it? About the third quarter of this year, ROG says, ushering in the era of truly premium gaming smartphones.